Arguments in favor of cutting public expenditures on anti-poverty programs—and restricting program eligibility by imposing onerous work or drug testing requirements—usually go something like this: The War on Poverty was a failed waste of taxpayer dollars because there are more people in poverty now than 50 years ago. The biggest problem with this claim is that the official poverty rate obscures most of the effects of anti-poverty programs. That’s because the official poverty rate only captures before-tax cash income, whereas the vast majority of spending on anti-poverty programs comes in the form of in-kind (i.e., non-cash) benefits and tax credits. Hence, the official measure misses the impact of the very programs critics of the War on Poverty are opposed to, including nutritional assistance, subsidized housing, home energy assistance, and tax credits. The supplemental poverty measure (SPM) is actually a more accurate measure of poverty because it accounts for those resources missed in the official poverty rate. Based on this estimated historical series of the SPM, the overall poverty rate in fact declined 5.6 percentage points between 1970 and 2014. Among children, the rate fell 7.6 percentage points and poverty rates among children of color were cut by almost half. However, even the official poverty rate, which neglects important safety net programs in its calculation, shows a large reduction in poverty among black and Hispanic children. The first chart illustrates those demographic trends since 1976, when data was first available for consistently defined race and ethnic groups. 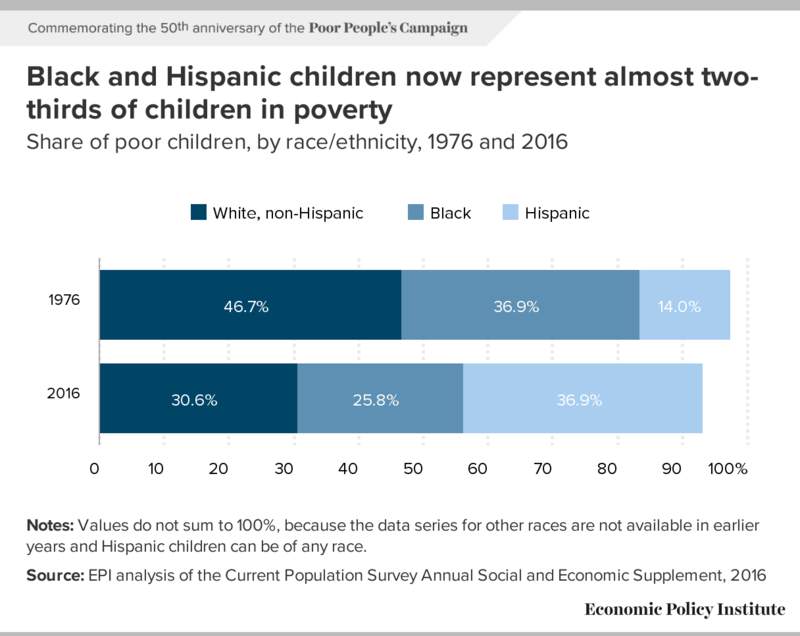 Over the period shown, the poverty rates for black and Hispanic children declined 9.8 and 3.6 percentage points, respectively. What is puzzling about these trends is the fact that the overall child poverty rate increased 2.0 percentage points between 1976 and 2016. 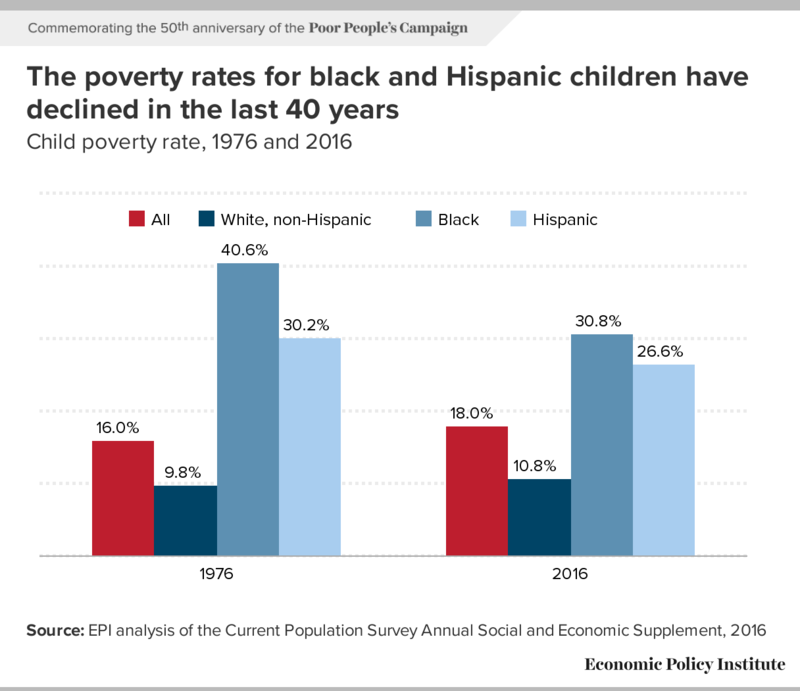 The poverty rate for white children increased 1.0 percentage point over the same period of time, but still remained much lower than the rates for black and Hispanic children. As we noted above, the rise in the official child poverty rate is often invoked as proof that spending on anti-poverty programs is counterproductive. The more interesting and accurate interpretation of this rise, however, is that racial inequality has had a growing effect on national economic well-being as people of color become a larger share of the population. The second chart reveals the demographic shift behind these seemingly contradictory patterns. In 1976, just over half of children in poverty were black or Hispanic. By 2016, black and Hispanic children represented about 63 percent of children in poverty. So, the overall child poverty rate increased over this time largely because black and Hispanic children—whose poverty rates (both official and supplemental) actually fell, but were still much higher than those of white children—make up a larger share of poor children. Notes: Values do not sum to 100%, because the data series for other races are not available in earlier years and Hispanic children can be of any race. Contrary to what opponents would like the public to believe, War on Poverty programs like welfare and food stamps—now Temporary Assistance for Needy Families and the Supplemental Nutrition Assistance Program, respectively—as well as the Special Supplemental Nutrition Program for Women, Infants, and Children (WIC), did not create more poverty. In fact, a previous snapshot suggests that compared to peer countries with much lower post-tax, post-transfer poverty rates, the United States doesn’t spend enough on anti-poverty programs. The consequences of making ill-informed decisions about anti-poverty programs based on inaccurate or incomplete information are especially serious for children of color. Unfortunately, racism has often been used as a tool to turn public sentiment against anti-poverty programs instead of constructively using these programs to reduce racial inequality. If we are serious about moving toward a future with less poverty, we must strengthen the social safety net and constructively remedy racial inequality.